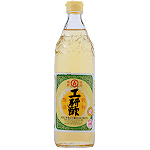 So many ways to make rice vinegar, it should be made from rice wine. While others must process their rice by hand which brings about contamination, our new facilities in Taipei includes a state-of-the-art fermentor that doubles as an autoclave to eliminate any chance of contamination. It allows us to utilize the best yeast and koji culture for the best rice wine available.There is no substitute for the rich aroma and flavor of rice wine fermentation which gives rise to a typical amino acid profile as well as a large number of organic acids that are either members of the citric acid cycle or readily converted to those components of the cycle. Product of Taiwan.